I’m sick to death of those washed out, tired ol’ jalapeño peppers you get at the burrito take-out or on the side of your Mexican food. I think they have a machine that removes the flavor and then mixes them with the cheapest vinegar and salt. Doesn’t this trusty chilie deserve better? I like the way the sugar and the spices in the brine to balance the heat in these jalapeño pickles. I love the contrast of sweet and spicy. Jalapeños are highly inconsistent chilies. Sometimes they are mild and other times they pack some heat. I made sticky rice stuffed jalapeños for a potluck that were delicious, but like a game of “mouth Russian roulette.” Some were quite hot and some were fine so I had to warn people before they ate them. I find that pickling them evens out the heat levels. 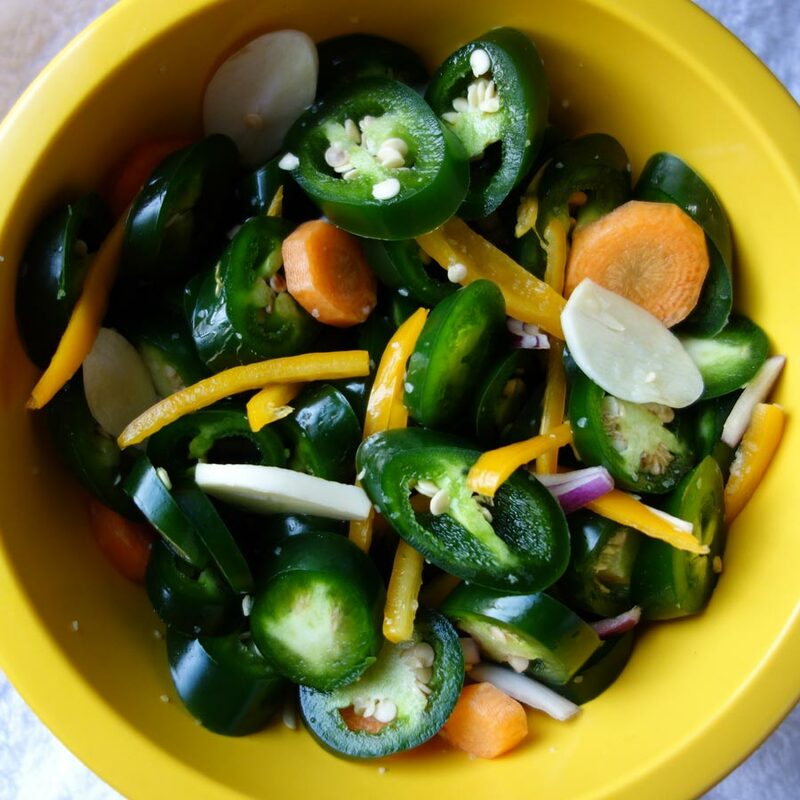 In a medium-size bowl, mix together the jalapeño peppers, red onions, carrots, yellow peppers, and garlic. Make brine by combining the vinegar, sugar, salt and spices in a saucepan and bring to a boil. Turn down the heat and simmer for five minutes. Drain and pack the jalapeño mixture into sterilized jars. Pour over hot brine through a strainer, then divide the loose spices evenly between the jars. Cool jars on rack. Store in cool place for at least one week before eating. If you don’t have enough brine, top off the jars with a little more vinegar. If you have too much brine, save it for making salad dressing.